Dallas was the one and only city we knew we had to visit on this trip. Shane’s cousin, Kelsey, and her husband, Jonathan, live on the outskirts and invited us to stay as long as we needed. We had an incredible weekend exploring local breweries, eating home cooked food, doing laundry, and even visiting an escape room! 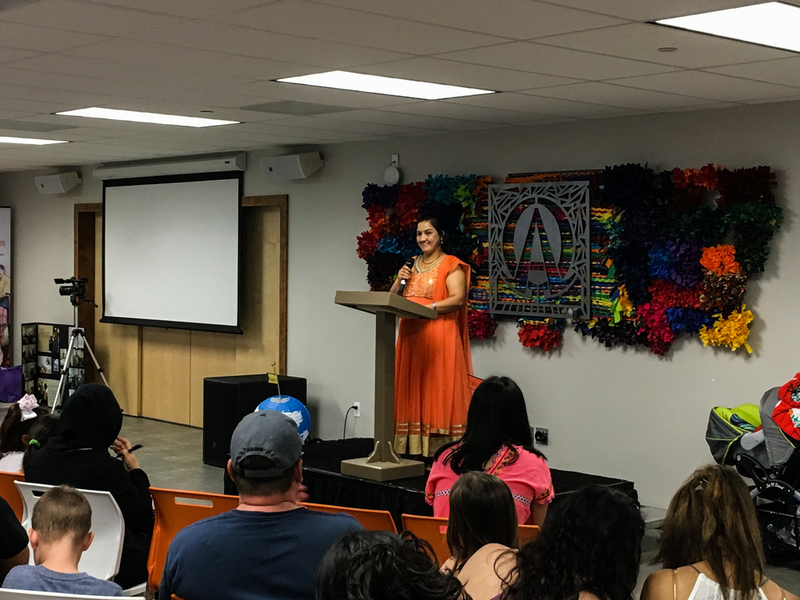 The World Refugee Day celebration brought together local organizations with a common purpose: assist refugees through the challenging process of beginning or continuing their lives in the US. Tables lined the walls with representatives from organizations providing English language lessons, health screenings, assistance with the legal side of the citizenship process, and much more. Kelsey worked at one table introducing people to New Roots Gardens, a community garden project, and farmer’s market that aim to get immigrants involved in gardening and put fresh produce into the hands of those who need it. She stood behind a tub of dirt and worms encouraging children to get their hands dirty! And they sure did. In a separate room, we watched a recognition ceremony of four women who had recently gained US citizenship. Each took the podium providing insight into life in their home countries and the lengthy processes that were their own paths to US citizenship – something the two of us take for granted every day. Their stories began in home countries like the Philippines and Iran, but all now walked proudly as US citizens! One young lady was most looking forward to voting in a presidential election while another held her head high announcing she had completed her master’s degree. The exact feeling in that room was indescribable, but witnessing the culmination of years of these women’s hard work was emotional. People with different backstories, faces of all colors, clothing of all styles. Stories bridged gaps. Children played across cultures. Beauty filled the room. To Amy and Petter… The two of you have been such a joy to know over the years. And even more beautiful is to now know you as a couple. Happy belated anniversary! This wasn’t planned because of your request; it just happened and seemed so fitting! We witnessed the good the IRC does for so many and the efficiency at which they use donations. As a result, Project Wildness has made a donation to the IRC in your name having seen firsthand some of the programs in place to serve the refugee population. Thanks for your continued support! To Evan… Before leaving on our second trip last year I had dinner with you and your family. I was able to share some stories from our first trip over a great meal before taking you and your brother for a ride in the go-kart. I also had the chance to visit your garden and see the start of a great passion within you. Before leaving you gave me a donation with the stipulation that it must be used to help someone start a garden of their own or help someone buy fresh produce. While at the World Refugee Day event I had the chance to talk with some incredible people running a program called New Roots Gardens. They provide refugees the opportunity to start gardens that can help supply fresh food to their family or be sold at a local farmer’s market. I can’t imagine a better group of people to use your donation. Because of your kindness, refugee families will be able to grow their own gardens and have fresh vegetables just like you get from your garden. Keep following your passion and keep doing good!